It’s normal for a digital painting’s mess to spill out of bounds; so just like you’ll spend time crafting your painting, you’ll spend quite an amount cleaning up and fine tuning too. For us digital artists, its pretty much a routine, and we have to deal with it. Its pretty cool watching your paintings shape up as you clear the spill-outs; but as always, there are times when you will need to get your work done FAST, and cleaning up will not be practical. But worry not, there is a workaround for it and here’s a little tutorial that’ll help you jump up a few shortcuts and get rid of those work-times, starting from the initial sketching steps to the final painted image. > I use Autodesk’s Sketchbook Pro for most of my digital painting, simply because Sketchbook is easy, quick and powerful, and also because I find it too time consuming to paint in Photoshop. 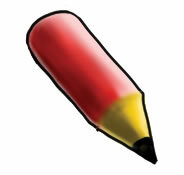 Its supposed to be used with a pen/touch interface (a graphic tablet or a tablet pc). In this tutorial, the painting stages are done in Sketchbook, and then exported to Photoshop for post-processing. > Like I said before, I use Photoshop to fine tune my images. For this, I normally save a Sketchbook draft as a .PSD file and then import it into Photoshop for further editing. > Wacom Intuos 3 tablet; without it, I wouldn’t be writing this. It is possible to do this entirely in Photoshop, or any other software that has a functional layer system and a Magic Wand tool. Corel Painter, GIMP, Paint.Net and Easy Sai are a few that supports layers. 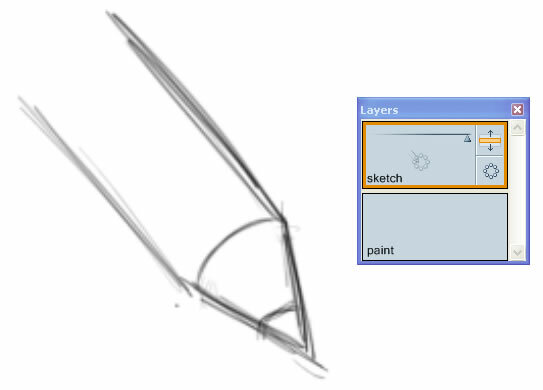 Then again, this is mainly a tutorial for beginners who didn’t know that Sketchbook can export as .PSDs to Photoshop. The lasso feature in Sketchbook is really useless, and the layers are pretty clumsy too, but its pretty minor enough not to interrupt your workflow. Ok, so lets move on to the tutorial. Fire up Sketchbook. Create 2 layers and name the first one (top) ‘sketch’ and the second one (bottom) ‘paint’. It should be like this. 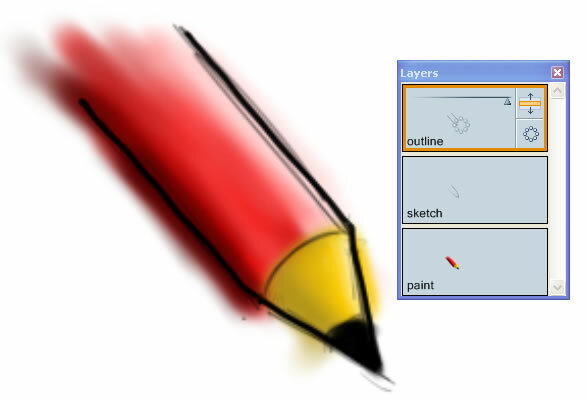 Select the ‘sketch’ layer and draw a rough sketch on it. 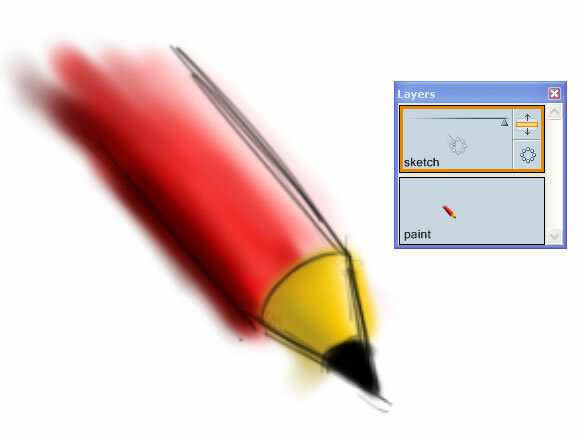 Select the ‘paint’ layer, paint/airbrush under the sketch and allow the paint to go beyond the outline. This tutorial does not deal with painting techniques or anything, so it may look bad, but thats not the point. Create a new layer and name it ‘outline’, and draw an outline around our drawn figure. Add the required colors and paint it until you feel satisfied with it. Delete the layer ‘sketch’. 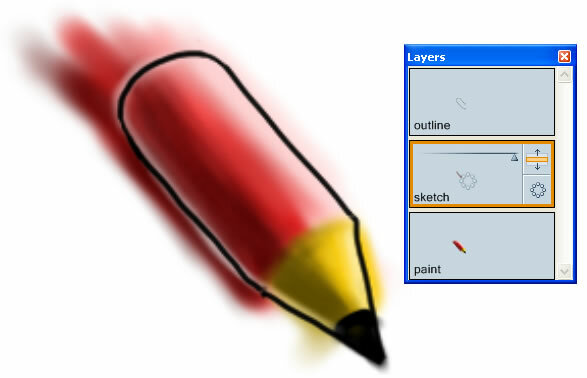 If you have more than 2 layers, select every layer and combine them with all layers exept the ‘outline’. Doing this will leave you with just 2 layers, one the ‘outline’ and the 2nd one will be a combination of other layers. You don’t really need to combine the rest of the layers because, doing so has 2 big disadvantages. First, you can’t edit them later on and second, you can’t dissect them again. But I’m more comfortable with combining, cause I do it when I finish an object. You don’t have to shift through many layers to get the job done. Save the draft as a .PSD file (File > Save As.. > Save as type > Adobe Photoshop PSD Files). This will allow you to open this file in Photoshop and edit, retaining the layers. Launch Photoshop and open the saved image. You should see the image just as it was in Sketchbook Pro, and also the layers, with the same names. 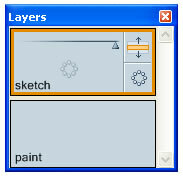 Click on the layer ‘outline’ and select the Magic Wand tool. Click any blank spot on the image. This will select and highlight the entire image other than the space the ‘outline’ layer. Adjust the Tolerance level or use the Refine Edge option (by right clicking on the canvas) to get a proper selection. Also, keep the Anti-Alias option checked. Then jump on to the layer ‘paint’. The Magic Wand’s selection should still be visible. Press the Delete key. Voila, the spill-outs gone! You can do this for any amount of objects in the canvas. I recommend grouping each objects under different folders, so it’ll be a lot more easier to manage. There are some limitations when using this method, like, its pretty much useless without an outline layer that defines the edges of the image or an object. That’s it! Hope it proved useful to you. This entry was posted on Wednesday, June 10th, 2009 at 7:13 am and is filed under Tutorials. You can follow any responses to this entry through the RSS 2.0 feed. You can leave a response, or trackback from your own site.